To develop human resources that, through the support of government, industry, and academia, will contribute to the development and promotion of both automobile technology and industry by having the students play the main role in planning, designing, and constructing an automobile on their own in a competition of comprehensive monozukuri skills. (1)helping the students to independently develop their comprehensive monozukuri skills. (2)increasing the educational value of the experience by providing the students with an opportunity for the practical application of skills and knowledge that are connected to their classroom studies. (1)To be a place where monozukuri skills are verified while placing the highest priority on ensuring safety. (2)To conduct the competition in connection with representatives of industry, government, and academia. (3)To conduct the competition with a wide range of both individual and corporate volunteers. (4)To conduct the competition as a non-profit, public enterprise. (5)To build a network of student formula competition participants that will contribute to exchange between engineers that transcends corporate frameworks. The serious state of affairs where, in addition to the reduction in the number of students due to the falling birthrate, young people are shying away from scientific fields, might lead to the Japanese automobile industry losing its international technological competitive power in the future, reduce the competitive edge of industry in general, and result in a shortage of talented engineers. Moreover, the curricula of engineering universities is currently lacking in practical, design/drawing elements etc., thereby resulting in a shortage of opportunities for object creation. On the other hand, "Formula SAE®" is held in the USa in order to provide opportunities for students to give full play to their ability and knowledge through actually creating objects. as a result, a base for nurturing human resources has been established under the cooperation of industry, academia, and governmental offices. although there are solar car conventions and robot contests as nationwide contests for object creation in Japan, there has been no design contest for giving full play to the special technologies obtained by students aiming at being active in automotive technology fields. Under these circumstances, JSAE decided to hold the "Student Formula SAE Competition of Japan". Students can actually create an object by themselves, which enables them to deepen their understanding of technology, cultivate their practical abilities and strive enthusiastically to achieve higher levels of accomplishment. The competition intends to aim at nurturing engineers who are rich in originality through an environment of object creation, in which they can learn the essence of object creation and the processes this entails, as well as experiencing team activities, and the difficulty, interest and enjoyment of object creation. The competition will contribute to revitalize engineering education at universities and national colleges of technology by providing opportunities for object creation. Students themselves will organize a team to develop and produce a small racing car in the formula style, so that they can learn the essence of object creation and its relevant processes, and feel for themselves the difficulty, interest and enjoyment of object creation. The competition will focus on the overall activities surrounding object creation, in other words not only the running performance, but also the marketing, the planning, the design, the production and the cost aspects of a vehicle. The competition is an opportunity for students to improve their own abilities and to provide an opportunity for them to present their skills as valuable resources to companies. In the USA it was noticed that excellent engineers cannot be nurtured only in classrooms. SAE International has held "Formula SAE " as "a practical student education program by having students create objects" since 1981, the year after Japan exceeded the USA in production of 4-wheel vehicles. Recently, the Big 3 and SAE International organized a consortium to make the Formula SAE a magnificent and international convention, in which more than 100 university teams have participated. More than 80 % of universities accept participation in the event as a credit. The competition site, aided by the many supporting companies, also functions as an opportunity to recruit students who are aiming at being active as engineers in the automotive industry in the future. 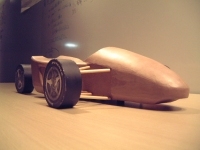 In this competition, students themselves organize a team to plan, design and produce a small formula-style racing car. However, the competition focuses on the overall activities surrounding object creation; in other words, not only the running performance, but also the car concept and design, as well as cost and other aspects of the vehicle. While creating their cars, students acquire a wide range of practical knowledge not limited to only machinery and electronics, and also strive to increase performance, reduce costs, and improve the marketability of their vehicle. This in turn sharpens their ability to self-identify and resolve problems－skills that are nowadays expected of young engineers and students. Leadership and teamwork among members is essential as well, and students gain valuable experience through object creation "MONO-ZUKURI" while also directly experiencing the magnificence and fun of creating objects. The Formula SAE Japan is conducted in compliance with the Formula SAE® Rules, the Local Rules of and the Participation Rules.